Anti-Bullying Week 2013 is launched in Leicestershire! Anti-Bullying Week 2013 was launched in style, with the help of Filbert Fox and some of his helpers from around the county! 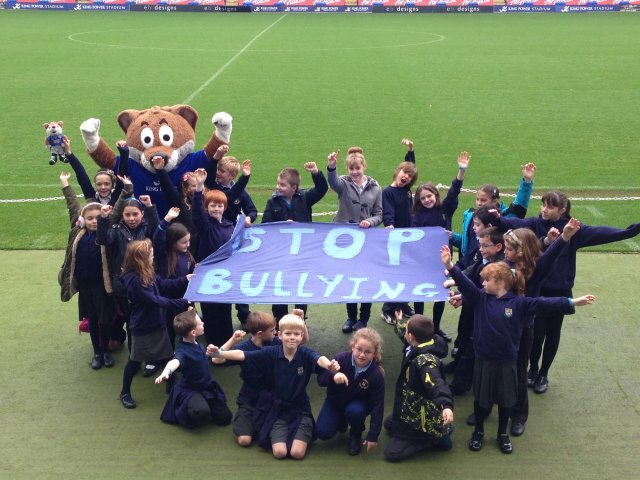 Children from Whitwick St John The Baptist Primary and Ratby Primary joined us in creating a visual message about bullying, and what better place to do it than at The King Power Stadium in all its blue glory! 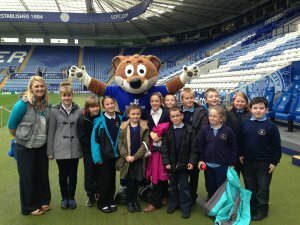 Peer supporters from St John The Bapsit and Peer Stars from Ratby came along to meet Filbert, talk to BBC Radio Leicester about the work they do and have a tour of the stadium. It was a great morning, setting the scene perfectly for the rest of the week. 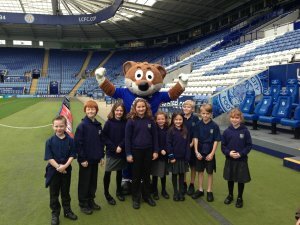 Ratby Primary's 'Peer Stars' with Filbert The Fox! Children and staff from St John the Bapsist Primary, Whitwick with Filbert the Fox! All the Peer supporters making a stand against bullying (with a little help from Filbert). The project called 'Reflect Respekt Restore' has European funding and includes Babington Community College, Charnwood College, Leicestershire Youth Offending Service, e-ngage and European partners in Svendborg, Denmark. Restorative approaches are a method of dealing with conflict through conversation and can be used when dealing with incidents of bullying and other inappropriate behaviour. The project will develop a website to provide and share information along with a DVD resource for information and training. FREE Brand New Anti-Bullying Resources! The Anti-Bullying Team have secured a free sample pack of Stonewalls new resources for secondary schools in the County. Packs are being sent out to Anti-Bullying leads next week during anti-bullying week so please look out for these. 'Calling Out' is a new anti-bullying story telling project written with the practical and financial support of Leicestershire County Council's Anti-Bullying Team. Exploring issues around different families and homophobic language, 'Calling Out' tells the story of a young boy and his personal experiences of being 'different' at school. The cost per performance to schools in Leicestershire will be £100, plus £25 per day expenses. The performance will last between 45 minutes and one hour, followed by post performance discussion with the group. Powerpoint assembly looking at the effects of misusing technology. Powerpoint assembly looking at positive and negative internet usage and the effects on society.